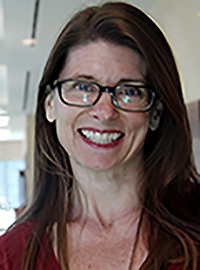 Jill Sonke is director of the Center for the Arts in Medicine at the University of Florida (UF) and Assistant Director of UF Health Shands Arts in Medicine. She serves on the faculty of the UF Center for Arts in Medicine and is an affiliated faculty member in the School of Theatre & Dance, the Center for African Studies, the STEM Translational Communication Center, the One Health Center, and the Center for Movement Disorders and Neurorestoration. Jill is also an Entrepreneurship Faculty Fellow in the UF Warrington College of Business and serves on the editorial board for Arts & Health journal, and the board of Citizens for Florida Arts. With 25 years of experience and leadership in arts in health, Jill is active in research, teaching, and international cultural exchange. Her current research focuses on the arts and health communication, the arts and community health, and the effects of music on cost and quality of care in emergency medicine.